Helper static method to return a notation escaped string. 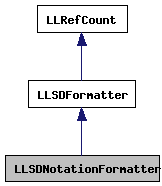 Formatter which outputs the original notation format for LLSD. Definition at line 351 of file llsdserialize.h. Definition at line 963 of file llsdserialize.cpp. Definition at line 958 of file llsdserialize.cpp. This method will return the notation escaped string, but not the surrounding serialization identifiers such as a double or single quote. It will be up to the caller to embed those as appropriate. in The raw, unescaped string. Returns an escaped string appropriate for serialization. Definition at line 967 of file llsdserialize.cpp. 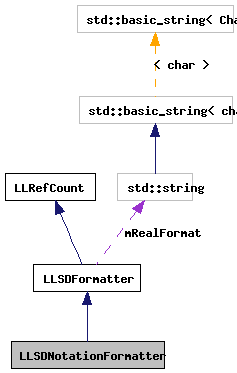 Referenced by LLFilterXMLRPCResponse2LLSD::process_impl(), and stream_out(). Definition at line 975 of file llsdserialize.cpp. References LLSD::asBinary(), LLSD::asBoolean(), LLSD::asDate(), LLSD::asInteger(), LLSD::asReal(), LLSD::asString(), LLSD::asUUID(), LLSD::beginArray(), LLSD::beginMap(), end, LLSD::endArray(), LLSD::endMap(), LLSDFormatter::formatReal(), LLSDFormatter::mBoolAlpha, LLSDFormatter::mRealFormat, NOTATION_FALSE_SERIAL(), NOTATION_TRUE_SERIAL(), S32, serialize_string(), LLSD::type(), LLSD::TypeArray, LLSD::TypeBinary, LLSD::TypeBoolean, LLSD::TypeDate, LLSD::TypeInteger, LLSD::TypeMap, LLSD::TypeReal, LLSD::TypeString, LLSD::TypeUndefined, LLSD::TypeURI, and LLSD::TypeUUID.